Traditional wooden chicken housing coops for sale, chicken coops, poultry housing, for sale in Surrey. Demonstrators available to view and coops in stock NOW! This coop is a basic/budget chicken coop and run at a very favourable price. · The house is suitable for up to 3 to 4 standard sized chickens (or more if used to house bantams). An extension run can be added if required. · Tongue and groove shiplap cladding, made with tanilised timber. · Onduline roof – hinged for ease of access and cleaning. · Two removable perches and a sliding pop hole for chickens access to the run. · Run - made with 25mm square 16 gauge, heavy mesh. Now comes with door at end of run (not shown in picture). · One piece lift off run top, locks in closed position. Plus run top slides away from house to access pop hole and to access feed/water (see picture opposite). · Comes flat packed for easy transportation and self-assembly. · Can also be used for a broody coop, or for segregation of birds too. IN STOCK AND AVAILABLE TO TAKE AWAY TODAY! Run 180cm x 87cm x 53cm high or (6ft x 2’10” x 1’9” high). or (2’10” x 2’ x 2’6”) approx..
or (6ft x 2’10” x 1’9” high). A clear cover keeps your chickens and your chicken feeder dry and gives protection from the wind, rain and snow, whilst allowing maximum daylight through for your birds - comes with bungee hooks to attach the shade to the run – use Autumn through to late Spring. Stafford Junior Poultry House – A raised poultry house suitable for approximately 4 to 6 birds depending on breed. The Stafford Junior is the most popular of the Stafford range, with externally accessed nest box and slide out poop tray/floor for ease of cleaning both as standard. Comes with 2 removable perches and ramp to pop hole. The roof is hinged to allow access/cleaning of coop. Full ventilation is provided. The coop stands 15” from the floor. Being raised from the floor reduces rat/mice issues, and gives the chickens a dry area to dust bath in. Constructed with tanalised timber finished to a mid/dark brown colour during treatment. Roof is clad with 'Onduline' corrugated bitumen sheeting. Supplied flat packed with screws and fixings for easy self assembly. Chicken house dimensions: 89 cm wide x 63 cm deep x 115 cm high max (35"wide x 25"deep x 45" high max). The nest box with its lid adds a further 38cm (15") to the width. The house stands on 38 cm (15") legs. Chicken house dimensions 89 cm wide x 63 cm deep x 115 cm high max (35"wide x 25"deep x 45" high max). The nest box with its lid adds a further 38cm (15") to the width. The house stands on 38 cm (15") legs. 16 gauge heavy weld mesh, there is one closed end with door to let your hens out in the garden, and one open end to stand against chicken house. The run top is removable and is in 3 separate sections. Run approx 114cm x 274cm x 76cm high or (9ft x 3’9” x 30” high). When purchasing the run with the Stafford Junior House, you will need the weld mesh and frame leg closing kit to enclose the underside of the coop. Stafford ‘Standard’ Poultry House - A raised poultry house suitable for approximately 8 to 10 birds depending on breed, fitted with externally accessed nest box and slide out poop tray/floor for ease of cleaning both as standard. Comes with 2 removable perches and ramp to pop hole. The roof is hinged to allow access/cleaning of coop. Ventilation is provided. Chicken house dimensions: 107cm wide x 84cm deep x 115 cm high (42"wide x 33"deep x 45"high). The nest box with its lid adds 38 cm (15") to width. The house stands on 38cm (15”) legs. Chicken house dimensions: 107cm wide x 84cm deep x 115 cm high (42"wide x 33"deep x 45"high). The nest box with its lid adds 38 cm (15") to width. The house stands on 38cm (15”) legs. Constructed with tanilised timber framing and 25 mm square 16 gauge heavy weld mesh, there is one closed end with door to let your hens out in the garden, and one open end to stand against chicken house. The run top is removable and is in 3 sections. A stand alone house, slide out poop tray, onduline roof, two external nest boxes. Run can be purchased separately. 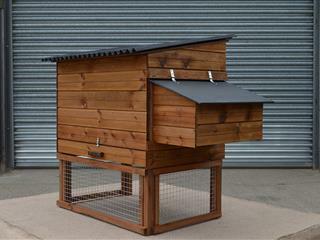 · Suitable for 6-8 standard sized chickens (more if used to house bantams). · Excellent build quality with tongue and groove shiplap cladding, made with tanilised timber. · Onduline roof – hinged for ease of access for cleaning. · Double nest box - with hinged lid for quick/clean egg collection. · Slide out droppings tray for ease of cleaning. · Comes flat packed for self-assembly. A stand alone house, with slide out poop tray, onduline roof, two external nest boxes. The run can be purchased separately if needed. Constructed of pressure treated timber framing and 25 mm square 16 gauge heavy weld mesh, there is one closed end with door to let your hens out in the garden, and one open end to stand against chicken house. The run top is removable or will slide away from the house for access to coop pop hole etc. At ground level there is an 8" (20cm) skirt/baffle giving protection, and to stop woodchip from inside the run being thrown out. Available to view and in stock NOW! As an added addition to all poultry housing, how about considering purchasing either electrified or non-electrified POULTRY NETTING kit – giving your chickens a ‘controlled’ extra space to roam freely? – see our Accessories Page for further details. (01372) 458320, or 07963 013597 - (9.00am to 6.00pm 7 days a week). (10.00am to 4.30pm) ALL YEAR ROUND. Please telephone and make an appointment to come and see us.